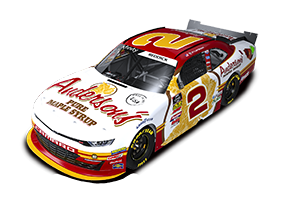 Anderson's Maple Syrup will be partnering with Super Late Model team DDP Motorsports to be their primary sponsor for the 2016 season. Dennis Prunty, car owner and driver of the Anderson’s Pure Maple Syrup #42, is a 25 year veteran of the sport and plans to kick off his 2016 racing season at the Fairgrounds Speedway in Nashville, Tennessee on Friday and Saturday, April 8th and 9th, in the ARCA/CRA 125. Anderson's would like to wish Dennis luck and are excited to be a partnering with DDP Motorsports for the 2016 season. Continue to check back as new updates get posted. DDP Motorsports and Dennis Prunty definitely had a good shot at winning it all in Nashville. Dennis was getting ready to take the lead in the CRA 50 on Friday night when his oil pump belt broke. Without the pump operating properly, the engine quickly pumped all the oil completely out and blew the engine. Next Sunday DDP will be debuting a brand new Anderson's Pure Maple Syrup/Pathfinder Chassis/DDP Motorsports #42 in Wisconsin Dells for the Ice Breaker 100 at Dells Raceway Park. With their new Anderson's/Pathfinder car all set-up for Madison next weekend and the other car getting the motor rebuilt after Nashville, the DDP Motorsports crew broke out the car they ran last year at Slinger and won the 2016 Slinger Spring Opener 75 Lap Feature. Dennis led the way for the first 31 laps of the race and hung on for a 3rd place finish. This was the team's first true complete race shake down for their new Anderson's/Pathfinder car and they're expecting good things from this car in the future. Dennis also closed in on the world record for a Super Late Model on a 1/4 mile asphalt oval with a lap of 11.22 seconds. The current record is 11.095 held by Tony Strupp and set in 1994. May 22nd - Slinger Speedway - Won heat race, started feature 11th and finished 5th. After dominating his heat race and winning by nearly 10 car lengths, Dennis started 12th in the feature, and within about 10 laps he got the car up to 5th spot. With about 10 laps to go, Dennis was battling for 1st but there was not much left on the tires. That became very apparent when a couple cars that he easily passed to get up to second, came back to pass him with only a few laps to go, pushing him back to 4th. After starting the race 15th, Dennis was caught up in an early wreck in the feature on Lap 4. He needed to pit for some repairs and had to re-start from the back of the pack, but was able to fight his way back up through the field for a 12th place finish in the 75 Lap Feature. Dennis slipped up a little coming out of turn 2 during qualifying and had to start the feature in the middle of the field. During the feature, a car got loose coming out of turn 2 on Lap 1, causing cars to scramble to avoid crashing. Everyone took off heading into turn 3, with Dennis running the high line. Another car, which appeared to be having handling problems, drove into turn 3 way too hot using the lower line. That car slid (washed up) and crashed into Dennis, sending him airborne, completely out of control and slamming into the outside wall between turns 3 & 4. Dennis was transported to the UW Hospital in Madison as a precaution, was kept over night for observation and was cleared and released around noon the next day. The new Pathfinder Chassis / Anderson's Pure Maple Syrup #42 race car was completely destroyed in the crash. However, Dennis felt well enough to take the other #42 to Slinger on Sunday night to get in a little practice only. June 26th - Slinger Speedway - Dennis was still pretty sore from the crash at Madison International Speedway last Friday night but was still able to race. He qualified 4th for the Pepsi (Race #2 of 3) Challenge Series. After the inverted (dice roll) start, Dennis started the feature on the outside of row 3. In about 17 Laps, Dennis took over the lead and stayed up front the rest of the way, finishing in 1st Place. July 3rd - Slinger Speedway - Another win at Slinger for Dennis - the 42nd Super Late Model victory of his career! With the #42 already set-up for this Thursday night's White Race at WIR in Kaukauna, and Pathfinder putting the final touches on the new race car they're building, DDP broke out the #22. Dennis was running really strong, leading at about the midway point of the race. After a caution with about 20 Laps to go, Dennis took the outside line at the restart, had a little handling trouble with the car and finished 2nd. With 39 laps to go in the 50 Lap "White Race" feature, Dennis and another car made contact on the backstretch and the #42 skidded into the inside retaining wall. Unfortunately there was a little too much damage to the Anderson's Pure Maple Syrup / Pathfinder Chassis / DDP Motorsports #42 to return to the race, ending Dennis' night. DDP Motorsports was able to put the Anderson's Pure Maple Syrup / Pathfinder Chassis / DDP Motorsports #42 back together after the incident at WIR on Thursday and race it again at the Slinger Nationals. Dennis qualified 14th and chose to race in the qualifier race instead of using a Past Champion's Provisional start, with the top 12 qualifiers automatically transferring into the feature - Dennis finished 2nd in the qualifier race and started 14th in the Feature. He made it up to the front and led lap 53, but at one point in the race, Dennis made heavy contact with the wall, bending a lower control arm. From that point on, Dennis said that it was the worst handling car he's ever driven. He somehow still ended up 6th, on the lead lap. Matt Kenseth won the race in the new Pathfinder Chassis "House Car", after starting in the 6th position. Thanks Matt for letting Anderson's Pure Maple Syrup be a part of your successful run at the Slinger Nationals in front of a capacity crowd - the Pathfinder Chassis "House Car" looked spectacular. Dennis will be driving this car on Friday night (7/22) at the Madison International Speedway in Oregon, Wisconsin. Click here for a video highlight of the race, courtesy of the Midwest Racing Connection. The new Anderson's Pure Maple Syrup / DDP Motorsports #42 / Pathfinder Chassis "House Car" was running really good and in position to have a great starting spot in the feature. However, the team found a flat tire after the heat race that had to be changed. By rule, they then had to start the feature from the back of the field. Dennis did a great job of driving in the caution free 50 lap race and brought the #42 up to a 3rd place finish, on the lead Lap. At the last minute, DDP Motorsports decided to race at the Slinger Speedway and ran the Anderson's Pure Maple Syrup / Wiedmeyer Express / DDP Motorsports #22. Dennis was running really strong and battling for the lead with about 15 laps to go when he and the leader made contact on the front stretch. As a result, Dennis' car went sideways going into turn one, but he did a spectacular job of driving to save from wrecking and was able to finish the race in 3rd place. Dennis was running good and leading the race in the Anderson's Pure Maple Syrup #22 when, on Lap 55, he thought he had a tire going down. Coming out of turn 4, the #22 got loose and made contact with another car. Dennis lost control, skidded into the infield, and then got hit by another car. As a result of this, Dennis' night was over. Next up on the DDP Motorsports schedule is the ARCA Midwest Tour 250 at the Wisconsin International Raceway in Kaukauna, Wisconsin on Tuesday, August 2nd, where Dennis will be racing the Anderson's Pure Maple Syrup #42 / DDP Motorsports / Pathfinder Chassis "House Car". The Anderson's Pure Maple Syrup #42 / DDP Motorsports / Pathfinder Chassis "House Car" ran great - Dennis never even put a scratch on the car en route to a 1st place in one of the biggest Super Late Model racing events in the country. This was truly one of the "sweetest" victories of Dennis Prunty's 25+ year racing career. Dennis started 5th in the 50 Lap "Blue Race" feature, got stuck on the inside lane battling traffic for several Laps, and quickly found himself in 10th spot. After finally getting past some slower traffic, Dennis was able to get the Anderson's Pure Maple Syrup #42 / DDP Motorsports / Pathfinder Chassis "House Car" up to an impressive 2nd place finish. The #42 Anderson's Pure Maple Syrup / Pathfinder Chassis house car was running great until about the halfway point in the race, when Dennis scraped the wall coming out of turn 4. With the car now a little banged up, Dennis was still able to finish 2nd. When the team had a chance to look the car over after the race, they were amazed at the amount of damage the car had and how Dennis was still able to keep it running up front on the lead lap! September 4th - Super Late Model 100 Season Finale at the Slinger Speedway - 1st. September 24th - ARCA Midwest Tour at the Elko Speedway in Elko, MN - 15th. Dennis started 31st in the 32 car field after racing his way into the AA400 at Fairgrounds Speedway through a qualifying race the night before. The team struggled with the car early in the race but eventually got it dialed in, running better lap times than the leaders after the final pit stop. Dennis was in position to get into the top 15 or better, when on lap 377, another car came down on his right front coming out of turn 4. As a result of the incident, Dennis got a flat on the right front and scraped the wall going down the front stretch. Unfortunately that ended Dennis' day in 21st place. The Pathfinder house car was running great as Dennis qualified in the top 10, with only 0.321 seconds separating positions 1 through 10. During the race, Dennis said the car felt good, but unfortunately around Lap 105, the motor blew and his day was over.